Avatars and profile pictures are everywhere on the web. But aside from being pretty, they serve two important functions. First off, they’re easier than written names for the human eye to identify and secondly, they take up less real estate on cluttered screens. Getting users to upload an avatar, however, is tricky; even advanced platforms like LinkedIn struggle with an abundance of picture-less accounts. Getting users to upload a good profile picture, where the face isn’t too obscured, is even more difficult. Platform designers face the additional challenge of needing to consider what dozens—if not hundreds or thousands–of profiles will look like when laid out side by side. For something as individualistic as Facebook, mismatched profile pictures are fine. But for commercial uses, such as needing to look at service providers side by side, it’s not ideal. Given these considerations, the key to creating a good avatar comes down to the cropping. But if you suggest to your users that they do their own cropping, you are unlikely to receive much of a response. The next best thing is to incorporate a self-service cropping tool into your GUI, but that adds additional time to setting up an account and can be annoying for users. As a photography platform, we wanted to solve this issue once and for all for users. Our solution was to crop the pictures for our users, but not manually. Rather, we used robots! Let’s start by breaking our process down into steps, before we explain how we tied each step together to solve the problem. Now that we have the face, it’s time to get the bounding box. The face.BoundingBox property will have a set of four values that specify the left, width, top, and height of the face. These values have been normalized to zero to one, with zero being far left/top and one being far right/bottom. So before we can use them, we need to convert them into absolute (pixel) values. This takes us to the next step. We have the position of the face, and now we need to crop out the unwanted parts of the image. We’ll write our own cropping function in Node.js to do what we want. Traditionally, you would use a third-party library like ImageMagick to do the heavy lifting. We prefer a relatively new library called lwip because it doesn’t have any external runtime dependencies and can be installed super quickly via NPM. The bonus of using lwip is that it handles streams out of the box, so we can just pipe the data directly from S3 into memory to do the image processing without needing to store it to disk first! · Crop – does what it says on the box: crops the image to the dimensions we specified. · Sharpen – when the image is reduced in size it looks nicer if we artificially sharpen the image a little. Tweak this value to taste. · Cover – this is the most fancy call in the stack. It resizes and crops the image to the supplied dimensions so that our optimized image is always the same size and aspect ratio. · toBuffer – converts the lwip image object to a buffer object that can be passed to S3. If you’re running any kind of platform that involves user profile images, why not give a cropping method like this a try? Cropping is important, but there are so many other things that go into a good profile picture. In fact, Snappr has built a tool that analyzes all the critical elements for you! It’s called the Snappr Photo Analyzer. You can try it for free right here. We are now in the process of building a tool that analyzes dating photos, so stay tuned for more on that. Never underestimate the importance of photography in creating amazing software that people love. The Airbnb story—where they didn’t reach a point of breakout traction until they started a program of taking free professional photos of their host’s homes—is a perfect example. If you need great pro photography taken for your platform or your users, Snappr operates in both the US and Australia with amazing, pre-vetted photographers available to book with as little as 30 minutes’ notice. Snappr allows you to book a professional photographer for any occasion as easily as you might book an Uber, at affordable fixed prices. 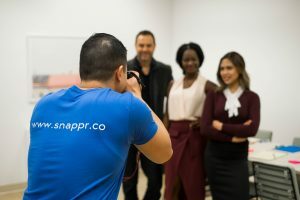 They also run the Snappr Photo Analyzer, a free AI tool that assesses your professional profile picture and tells you how you can improve it. Snappr believes that amazing photography should be within reach for everyone. Amazon Rekognition makes it easy to add image analysis to apps. Rekognition allows you to detect objects, scenes, and faces in images. You can even search and compare faces. The Rekognition API lets you easily build powerful visual search and discovery into your applications. For more information, see Introducing Amazon Rekognition.